The following information comprises extracts from "The Clydesdale Horse". A Resource Book published by the CCHS (NSW Branch) in addition to the Foreward of the first CCHS Stud Book. "It was not, however, until the 1850’s, following the discovery of gold in New South Wales and Victoria, that draught horse breeding received its greatest impetus. 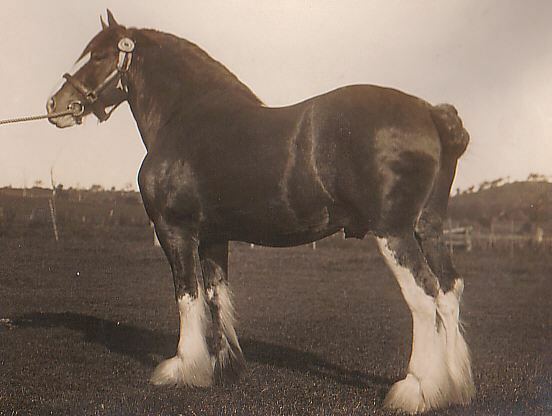 Victoria became the centre of this activity, and the lead was there given for the introduction of the best breeding stock from Scotland, ... with the development of the agricultural industry, draught horse breeding made rapid progress, aided principally by the introduction of some of the best strains of the Clydesdale breed." 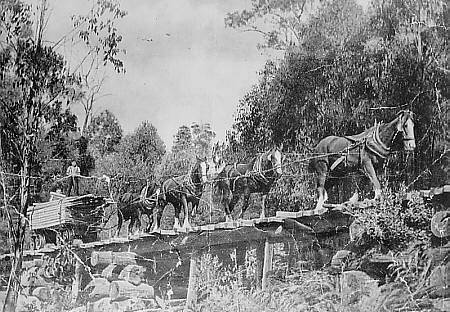 "The establishing of a stud book for Draught Horses in Australia was first considered by the Council of the Royal Agricultural Society of Victoria as far back as 1885. No definite action was taken until October 1903, when that Society appointed a committee to report on the matter." Much credit is due to those enterprising breeders who maintained their faith in the Clydesdale horse and who, in spite of the decline in horse breeding following the Great War, not only preserved their studs, but improved them through the introduction of fresh sire blood." The first volume was published in 1907, and until after the last issue of its seventh volume, the Draught Horse Stud Book of Australia was the only stud book for draught horses published in Australia. In 1917, the first volume of the Australian Clydesdale Stud Book was published by the newly established Australian Clydesdale Society. 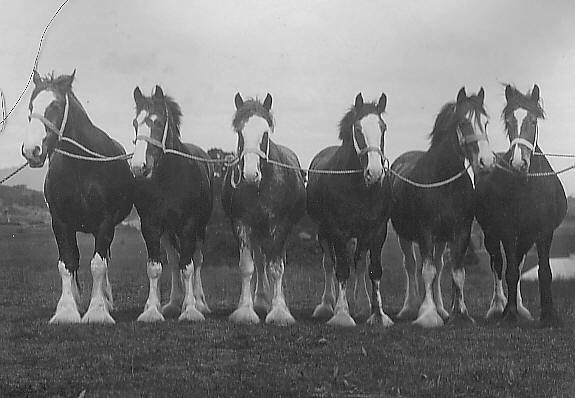 It was unanimously agreed that the standard for stallions should be "four top crosses" and for mares "three top crosses" of Clydesdale breeding, which were the regulations governing registration in the Australian Clydesdale Stud Book ... at a meeting in Sydney in March, 1921, ... Rules and Regulations were adopted, and it was decided that entries for the first volume of the Commonwealth Clydesdale Stud Book should close on 30th September 1921. ... Captain A. E. T. Payne (President of the Victorian Branch) was unanimously elected first President of the Society ... Following this meeting, the Society was accorded the hearty support of Clydesdale enthusiasts throughout the Commonwealth." Melbourne Show was again held for the first time post-war in 1946..."
The horse market was in the doldrums and good horses were sold for a pittance... . By the late 1950’s Draught Horse values dropped to rock bottom. About this time some Australian breeders claim they saw quality mares almost given away. A turning point came late in the 1960’s when interest slowly increased in the heavy horse..."
Since 1970 there has been a resurgence of interest in the Clydesdale horse in Australia. The use of Clydesdales in brewery teams around Australia has greatly increased the profile of the breed. The pleasure and experience of owning and working this magnificent horse has seen the introduction of many new converts to the breed. The numbers of exhibitors at local shows have been on the increase and more working classes are appearing in show schedules. Most recently ridden Clydesdales have been a main feature at many Royal and local shows. The annual Membership of the Society is approximately 700 members distributed across 5 state branches. Bi annually the Society produces a Stud Book record of the breeding, transfers and deaths of the horses as well as an inventory of Members. The 39th stud book published during 2016 is available for purchase from the Federal Office. The total number of horses registered in Australia since the start of registrations in 1924 up until 1st August 2016 is 9347 Stallions/Geldings and 19068 Mares. State Branches conduct annual events promoting the breed and on a rotation basis the Max Fowler Award is held for the best Gelding. This Federal Council award was created in memory of one of our long serving breeders and judges the late Mr Max Fowler. Please refer to the events page which will contain details of the shows and activities held in each state. The 2018 year is the 100th year of the Society. The Society intends to run special events to celebrate the milestone and a memento will be struck in recognition of this occasion.